← [How-to] Revert Your Captivate To Stock with Odin3 “One-Click”! Of the four devices, three are confirmed to be running the as of yet unreleased WebOS version 2.5.1. The PalmPad will predictably be available on Sprint, and is happily blessed with a 4G radio (you hear that Galaxy Tab?!). Sprint’s WiMAX service offers a sizeable enough downstream to enjoy high-quality streaming video, which would go great with the included mini-HDMI port on Palm’s tablet (no dongle required). Another welcome feature is the inclusion of two cameras, a front-facing 1.3 megapixel camera and a rear-facing 3.0 megapixel camera, both sporting an LED flash or two. 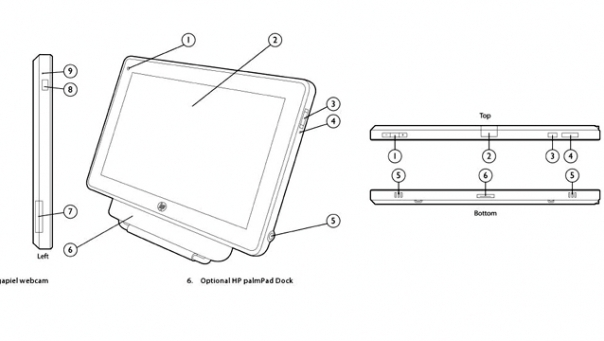 Keeping with the times, HP had the foresight to include a USB 3.0 device. The PalmPad is set to give the iPad body image issues with it’s thinner, sleeker chassis. Weighing in at 1.25lbs, the PalmPad is also said to be slightly skinnier than Apple’s juggernaut. Only the screen size for the University version is mentioned in the article, giving a diagonal measurement of 8.9″. HP plans on partnering with Universities to deliver internal educational software on the mobile device, designing all elements to fall within the University’s individual requirements. HP aims to let students at these devices by the fall semester, 2011. The rest of the specifications are sparse, Fox calls them “nearly identical” to the iPad, whatever that means. Check back for updates as information comes in!